Abstract: InventEUrs is an European project (Erasmus+) created for the purpose of adapting and improving a project that already exists, Inventors4Change, which has been promoting connections between underprivileged children in Spain and India and encouraging them to become agents of change in their communities with the help of collaborative digital storytelling. 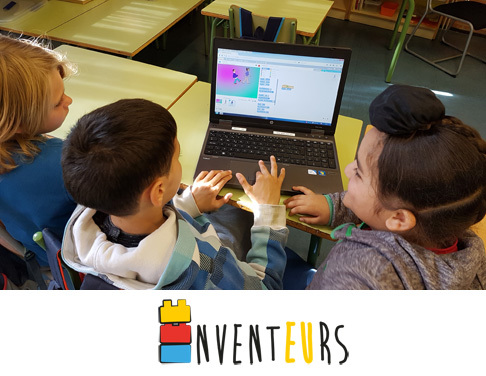 Under the scope of InventEUrs, newly arrived migrant children of disadvantaged schools in Europe will be interconnected among them and with children from other schools, and mixed virtual teams will co-create digital projects that revolve around global issues. Foster social inclusion, equity and Global Citizenship Education in disadvantaged schools in Europe (with particular emphasis on migrant children). Promote intercultural virtual exchanges and collaborative digital storytelling to foster mutual understanding and respect among children and young people with different ethnic or religious backgrounds. Promote critical thinking and digital media literacy among children and teachers by using computational thinking and cutting edge Creative Learning Technologies (like Scratch). Visit the project website for more information: inventeurs.eu.